Cambridge City Council leader, Liberal Democrat Cllr Tim Bick, voted in favour of the proposals, alongside representatives of the Fire Service, NHS, County Council and the voluntary sector. Cambridgeshire Police did not support the project and abstained though did not speak against it. The funding distributed by Cambridge Community Safety Partnership, and used for the rewards scheme, comes largely via Cambridgeshire’s Police and Crime Commissioner Graham Bright. The Commissioner is ultimately responsible for the taxpayer’s cash involved, so it will be interesting to see if he steps in to veto the rewards for anti-social behaviour scheme when he hears about it. Members of the partnership were told rewards for committing anti-social behaviour had been tried in the past with the result of keeping recipients out of the criminal justice system. At no point during the debate did any of those considering if this was a good thing to do, or a good way to spend public money, consider the impression it would give to young people who were not causing a problem to the society in which they live. My view is that rewarding anti-social behaviour in this way sends completely the wrong message. The Police and Crime Commissioner provides Cambridge’s Community Safety Partnership with money to spend as they see fit on their projects. The Commissioner he has announced via his draft Police and Crime Plan he is to run a series of “star chambers” at which he will challenge those spending money on his behalf to try and determine if they have been achieving value for money. As far as I can see the Commissioner has not yet made clear if he will conduct this scrutiny of how the cash he is responsible for is being spent in public. The money is to be spent via Cambridge City Council’s Children and Young People’s Participation Service (CHYPPS); a group of council officers who often stand around on play grounds looking to see if there are children who need help playing; and I recently spotted five of their staff with one child on the council’s playboat on Jesus Green. 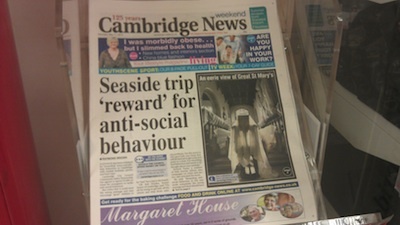 The Cambridge News has covered this with an article headlined : Council Slammed for giving young Cambridge Arsonists Beach Holidays. I’m quoted. Though not saying my key point which is even if the aims of reducing reoffending and reducing crime are achieved I think this is the wrong thing to do as it sends the wrong message to children. The key interesting point that it is cash from the Conservative Police & Crime Commissioner paying for these reported beach holidays for Cambridge’s arsonists is omitted. Perhaps on space grounds, or perhaps anticipating a follow up article after the commissioner finds out and pulls the plug on the project? Commenters on the Cambridge News article have been overwhelmingly critical of the scheme. It is notable that despite the leader of Cambridge City Council, Liberal Democrat, Tim Bick, voted for the scheme in person at the Community Safety Partnership meeting he put his officer up to defend it. 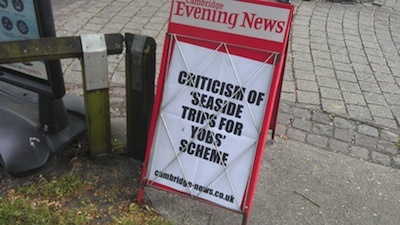 The Cambridge News have published another article on this: Council leader ‘proud’ of yobs’ holidays. It follows a written question from Cllr Rosenstiel to the last full council meeting which prompted the council leader Cllr Bick to defend his support of the scheme, and explain it further. The council’s webpage on the full council held on Thursday, 23rd May, 2013 still doesn’t carry the written questions and answers. This means the public who are seeking to find out the background to the Cambridge-News article, as at least one commenter on the Cambridge News website is, are unable to do so. It also means that even if Chris Havergal of the Cambridge News had wanted to properly cite and provide a link to the written answer he would not yet be able to do so. I note one of the written questions was not even responded to in papers distributed at the meeting. I think new Mayor Cllr Saunders needs to issue clear directions to officers at the next meeting to ensure the answers get published straight away.